Post subject: What is it? It's been too long since anyone put up a puzzler, so here's one that came to me recently. What is this, what's it used for, where would you find it, and is it right side up, or upside down? The most specific answer wins. I'll bite. It's a latch for a Companion Way lid, shown upside down. Its used to hold the horizontally sliding lid of a companion way cover, to the vertically sliding or swinging door. I'm with Frank; it looks like some sort of marine hardware/latch. Since it appears it's lying on your bench I suspect it would be installed horizontally, that is rotated 90deg clockwise, to latch a sliding panel that opens to the right. The raised portions would indicate that it rotates so the 'knob' disengages from the curved part releasing the panel. Configured as it is it could be used for either a right hand or left hand sliding panel. OK, Tom. Doesn't look like you've got a lot of takers on this one. Any chance on enlightening us on the real identity of that pice of hardware? Have I really stumped all of you, or is someone who knows the answer just being a good sport? I am surprised that no one has come up with the correct answer yet. You are both partially right, but most specifically wrong. It is a latch, of sorts. I'll leave it there for awhile in hopes that someone will pipe up with the rest of the answer. I can tell you it is nothing I have ever seen. Can't imagine what it would latch,. Your attempts at clue fishing are a trifle too transparent. That said, I will say that I think it is right side up based on the way it is generally used, and not the way it is advertised in catalogs. Well, I tried using Google image search and this is what it returned. Since Google is never wrong it's gotta be a Walrus! Well, I can't say that I expected that. Although you are quite specific, you are also quite incorrect. Thanks for playing though, and feel free to try again. TMS: well, time for the old WAG. Is the object the catch or latch from your Dads old tool chest, cleaned up for a repair/restoration of the old box? Still say it's a walrus. You can't put anything on the internet that isn't true. "They are the eggmen, I am the walrus. ps. Oysters are out of season. Ah, would that it were. What a wonderful notion, thank you for that. Unfortunately, Pop never had a "toolchest" per se. His shop was a warren of shelving, with more horizontal space per unit volume than most libraries. So, wrong also. But thanks for playing, and please feel free to try again. Ah yes, the thingamabob that does the job, with bibidy bobidy boo. Well no, actually. But thanks for playing and please feel free to try again. TMS: Here we go again. WAG time. BRANDT LEYTL got my first choice with thing-a-ma-bob, my second is it's a doohickey and third maybe it's a whatch-ma-callit. However thinking on all those lamb tongues maybe it is a latch for a storage space on a new "old" hall/entryway butler bench. "Who knows what lurks in the minds of men" bwaaha "the Shadow knows". No, no, and no. But thanks for playing, and feel free to try again. No, sorry. But you are starting to put things together. Yes, the latch is for the project with the lamb's tongues. Keep trying, you're on the right track. Brandtleytl, Sorry for butchering your tag. I was looking out of the wrong lens on the bifocals. It looks like you are building a bed or a mantelpiece in your infeed post. The ability to swing the latch in either direction suggests it needs to be able to be swung in place quickly like when you are lifting something heavy and might be in an awkward position. The fact that it does not have any positive locking mechanism suggests that it relies on gravity to hold whatever it is latching in place once the latch has swung closed. Is it a Murphy bed latch? Sorry, no. But thanks for playing, and please feel free to try again. Now I've got it! 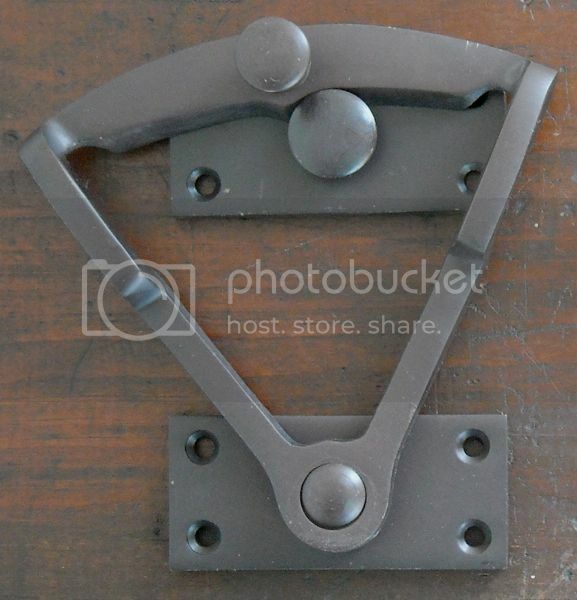 It's a Dutch Door Quadrant Latch. It's shown up-side-down and is used to latch the top and bottom halves of the door together so they open and close as a single door. Or I could still be wrong.